Have you been stung with a £200+ penalty fare or court summons? The consumer watchdog Passenger Focus is challenging rail operators to change the way they deal with passengers who don't have the right ticket. They want consistency, discretion, fairness, accountability, and transparency. They are also making a direct appeal for passengers to tell them of their experiences. By Anthony Smith, chief executive of Passenger Focus. Passenger Focus published today a major investigation into the passenger experience of Unpaid Fares Notices. No one is in favour of fare dodgers but innocent passengers are being swept up along with those who had no intention to pay. We have found cases of passengers who left their railcard at home but could prove later they had one, passengers who could not find one of their tickets but had proof of purchase and a ticket for one leg of the journey, and passengers who could not pick up tickets from a machine at a station (because the machines were not working) so were told by staff it was OK to get on. The common factor? No intention to defraud but all these passengers were hit with substantial ‘fines’ and, in some cases, threats of prosecution. We think the industry needs to start treating its passengers better by giving them a second chance and deal with these situations a bit more sensibly and flexibly. Before boarding a train it is the passenger’s responsibility to ensure that they have with them a valid ticket (or other form of authority to travel) for that train. Unless there were no facilities to buy a ticket or if a train company has put up notices saying you can buy one on board then you risk being pursued for ‘ticketless travel’ if you board without a valid ticket or authority. Train companies that wish to do so have three main options: they can charge the full-price single or return fare, they can, in certain areas, charge a ‘Penalty Fare’, or they can bring a criminal prosecution. It is hard to put a sense of scale on the issue. In the 2011 calendar year we received just under 400 appeal complaints from passengers who were being pursued for ticketless travel – 13% of our overall total – but we suspect this is just the tip of an iceberg. What we do know is that these cases can have a big impact on passengers and staff. Passengers resent the ‘fines’ levied and the accusation they are cheats, while front-line staff are left to manage the conflict this brings. At present we only have details of the cases we have received ourselves – there is no information from the industry as to how many fines are issued or prosecutions mounted. We think there should be. Not only will this provide a better sense of scale but, generally speaking, more transparency drives more accountability. Requiring train companies to set out how many penalties are issued, for what, and how many are subsequently overturned may impact on their behaviour. he took his email confirmation to the ticket office who told him to speak to the train conductor. He did so prior to boarding and was advised to get on. His details were taken later by a different member of staff. He subsequently received a court summons for not having a valid ticket. willing to pay £92 to ‘settle’. Ms B could not produce her 16-25 Railcard when asked. The ticket inspector issued an Unpaid Fares Notice and told her that this was just a ‘reminder’ and that if she could provide the railcard then it would be alright. Despite providing proof of her railcard her appeal was declined. Mrs C had her ticket checked on board the train. When she got off she left her ticket behind, believing that as it was an unstaffed station she would not need it again. A ticket check was in operation; she was subsequently offered an ‘out of court’ settlement if she paid £85 – the original ticket cost £2 and she had no prior record of ticketless travel. Miss F bought an Advance ticket for a long-distance journey. She used her railcard – which reduced the fare from £14 to just under £10. She forgot her railcard and was issued a penalty fare for £260 (twice the most expensive peak fare for that journey). She was willing and able to prove that she had a railcard after the event but to no avail. Clear rules for dealing with passengers with disabilities (including hidden disabilities), children and people for whom English is not a first language. Rules for where a passenger has a ticket, but not for that particular train or has missed a booked train. A formal right of appeal against any decision. Some train companies already operate ‘local’ guidelines and these can form a useful starting point when building a more consistent set of national criteria. Passengers should not face a criminal prosecution without proof of intent to defraud. • a debit/credit card receipt• subsequently showing that you did have a railcard – ultimately we see no reason why this could not be automatically checked via a secure database. We need your help to get this right! "4.26 Authorised collectors and other staff who sell tickets on trains often receive commission on the value of the tickets they sell. Some operators also pay staff a small amount of commission (typically 5%) on the value of the penalty fares charged. We have no objection to this, as long as the percentage is small and the relevant instructions about the use of discretion and the circumstances in which penalty fares may or may not be charged are strictly followed." 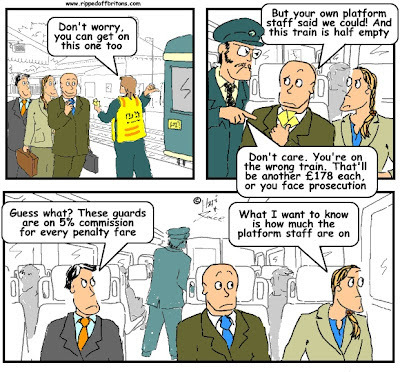 The whole system of "penalty fares" and commission for those who issue them is outrageous. The vagaries of the pricing of tickets is virtually entrapment... What happened to fair play? I am a train driver and can honestly say that all the guards I know are very fair in their dealings with passengers. They use discretion to differentiate between those who've made a mistake and those who think it's perfectly acceptable to use the service without paying. This is quite a separate issue from the fares structure and the privatization. Some guards I know couldn't care less about collecting fares and will only do enough to keep them off the managers' radar. Perhaps this story could be an example of blowing things out of proportion and demonizing workers. Maybe expend more effort looking at the corrupt way the train operating companies operate at director level and the millions of pounds squandered on lawyers in delay attribution disputes. I wonder if the people in these stories realised that they're all breaching NRCOC... It's NOT unreasonable to ask that you have the Ticket and if applicable the railcard you use to buy a ticket is it? Why should it be down to the guard to go and check elsewhere because the traveller couldn't be bothered to bring it? Would these same people go to an airport and try to board a plane to another country without a passport? No. So many points of this fail while demonising rail workers for passenger's wrongdoing (intentional or accidental) and just doing their jobs. Why would you discard your ticket just because it's been checked? It can be checked more than once, at ANY time. A lot of these issues would be avoided with simple common sense to be honest. This happened to me five years ago. Railway station was closed. This was a small station in a surburb of Birmingham prone to vandalism. Permit machine was bust so I just hopped on the train. Guard does an inspection, had a ticket machine with him. Fined me and said I should have bought at the station. He said I broke the law, I even had the money of £20 to pay the fine on me! Got a fine. Wrote to London Midland...stuck up for the guard. I was lumbered with a £300 fine....paid it off straight away. I later found out, the guard was sacked due to a punch-up. However...what made me mad was on the Birmingham to Coventry line - there was an incident with a woman locking herself in the loos, with her mobile the WHOLE journey and nothing was done about it. When the train stopped in Coventry, she came out and was shouting down the phone that I was sick of these people banging the door as I was on the phone!! Also, people were on the journey DRUNK...again nothing done. Complained to London Midland, said to grin and bear it. And to add to the above, the woman in the toilet DID NOT PAY and was on the same train as me! I was fined for not having a ticket when i WENT TO BUY A TICKET WHICH i THOUGHT WAS SOMETHING THAT COULD NEVER HAPPEN TO ANYONE, BUT IT DID IT HAPPENED TO ME AT SNOWHILL STATION. i WAS SUMMONSED TO COURT OVER THIS AND WATCHED THE WHOLE PROCESS FROM START TO FINISH WITH ME NOW HAVING A CRIMINAL RECORD - UNBELIEVABLE - BUT YES THAT IS WHAT HAPPENED TO ME AND THERE IS NOTHING STOPPING AN EMPLOYEE FROM ISSUING YOU WITH A PENALTY NOTICE NO MATTER WHERE YOU ARE? Indeed they have their constant focus on this.